A showmatch will occur during BlizzCon between Kim “Last” Sung Hyun and Yoonjong “Rain” Jung. This resurgence aided the StarCraft II scene as well. Cho “Maru” Seong Ju and Joona “Serral” Sotala are having historic years in StarCraft II. Maru is the first player to win all GSL seasons within the year. On the other side of the world, Serral conquered all four WCS Circuit Events – a feat unprecedented by other foreigners in the past. 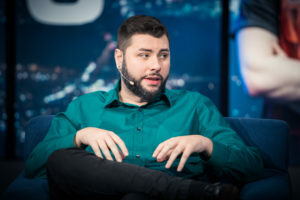 A man who’s experienced the StarCraft scene since the Brood War days, Nick “Tasteless” Plott, has gone through the rollercoaster of the scene from its peaks to its lows. During Blizzcon Opening Week, I had the opportunity to talk to the long-time StarCraft caster about the history of the StarCraft II scene, his thoughts about Maru and Serral’s dominance, and if StarCraft is going through a resurgence. You’ve witnessed the game’s evolution since beta. Can you name the best and worst things you’ve witnessed throughout the years? I’ll do the worst things first – it was definitely right in Heart of the Swarm (HotS) when the Swarm Hosts came out because the whole game slowed down so much. And I thought the pacing and everything, that was harder for me as a caster trying to keep it hype and interesting. That was probably the toughest spot, but Blizzard is pretty good at fixing anything that’s a problem in the game. I mean, we’re in 2018 now, this has just been the best year for StarCraft II. I’m not saying it because it’s a cool thing to say. Our numbers have gone way up and the game is in a really good spot. Finally, non-Koreans are actually doing well, which is really cool. We might actually see Serral win – we might even see Neeb do insanely well here too. That’s my favourite part. I would say in general, the big picture, the fact that the scene keeps growing and the game keeps going on, the story will keep moving forward. Moving forward, do you think we are seeing a resurgence in foreign presence? With players like Neeb, Serral, and Showtime replacing the likes of HuK and IdrA. One big factor is that NoRegreT has a non-Korean team house – I guess there are actually some Koreans in there. Basically, you got a lot of non-Koreans living in Korea training and practising. The playing field is getting more even, which is really exciting. We definitely have players replacing the old guard. What’s crazy about this is that it seems according to a lot of the Koreans I talk to, they think the non-Koreans caught up or surpass them. I think one weird obstacle for StarCraft – I don’t think other games have this problem – is that the Koreans were so dominant that I think can deter people that might otherwise be interested. But now that we have other nations doing well, it’s super exciting. Who do you think were the best players you’ve seen in the StarCraft II scene? Mvp is one that you have to point out because of the results. That was also like a weird period of the game where we didn’t really know how it worked yet – it was like the first years in the game. I see the way Serral plays now is just so impressive. Maru is also the same way. Honestly, I’ll just say Serral and Maru. We haven’t had a Korean player do that well, winning all three GSLs. Then, we have Serral who won all four WCS events leading up to this. I would like to add Rogue as well. If I have to give another one, I would say sOs. A lot of people have come and gone in the scene. Besides passion, what kept you invested in StarCraft II? I just love the game. I grew up with it. When I first got a casting gig, which was in Singapore, I realised there’s a lot of people working down here and it’s something that you’re paid to do. I wonder if I can pull this caper off and start doing more and more StarCraft stuff. I already love the game – my wrist is messed up right now so I can’t play any games – the fact that I can take what I love and turn it into a job keeps me here, as corny as that sounds. Also, now that I’m older – I started casting when I was 19 and I’m 34 now – it’s kind of cool to see the pros grow up. It’s something you get as you age. I’m watching these little boys turn into men and they’re still competing. That part is really cool too. One thing that you get asked a lot with organisations that are not familiar with esports is, “What happens after this?” You realise there’s this whole infrastructure, not only coaching or something like that, you can work in so many aspects in esports. What are your opinions on players like MMA, Taeja, and possibly Polt coming back into the scene? It’s always exciting – they’re always welcomed back. If I remember correctly, they’ve all done their compulsory military service in Korea. When people come back from doing that, they don’t tend to do that well. Of course, I welcome them back. I would be super excited if they managed to compete at the same level. This is the one thing about RTSs (real time strategies), the more it gets unpacked, the harder it is to keep up. Do I think they’re going to be as good as before? I hope so! Is there one player that you would like to see back in GSL? NesTea (laughs). I think right now he is 38 [years old]? When we started doing GSL, he was like a guy who was older than us that was still pro gaming. There’s always the misconception that you can’t keep playing games and still be good. NesTea is up there and still winning GSL. I would love to see him back. Are there players that you wished stuck with the scene a little longer to see their true potential? I don’t have a good answer for that. Not really. It’s fun to see new faces. There’s always that nostalgia for old players, but when someone new starts to come out, that’s cool too. You don’t want to see the same eight people – this happened in Warcraft III a long time ago. What are your opinions on the health of the SC2 scene right now? It’s great. I think it is a lot less toxic. When StarCraft II came out, Reddit was horrible, Team Liquid was horrible, but I think people matured. The game grew and the people that were interested grew. I feel like now, the community is a much better spot than we’ve seen it before. Switching subjects, what are your thoughts on Maru and Serral’s dominance this year? This is almost too good to be true. Part of my job is trying to craft a narrative for the audience, explain why this matters, and why this is important. This almost seems like it’s out of a B-movie because it doesn’t seem believable. The possibility of us having finals like that and the thought of maybe having Serral win is going to be really healthy for the game. It’s going to kill a lot of pessimism people might have. When you hear people say, “Oh, the Koreans are so good, what’s the point in me learning?”, you can look at Serral. He did it. Lastly, is there anything you want to say to the fans? I love you guys. Thank you for watching my stuff.